Plot / The wife of a greedy man comes back to haunt him after he scares her to death in this horror-thriller. He is after her money and must try several times before he finally succeeds. 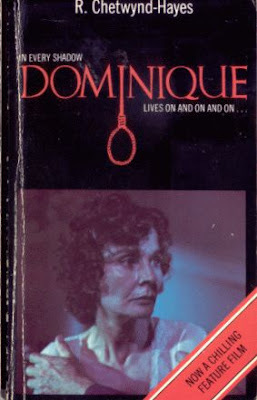 Because she is mentally exhausted from being frightened all the time, she commits suicide, but soon the husband begins experiencing her ghostly presence. This was an interesting little film. While a bit slow and maybe a tad too long, definitely a creepy element permeated throughout. The plot was common with at least an attempt at a twist ending and the acting and direction were average. Yet, even with the flaws it made for some decent entertainment with my daughters on Scary Movie Night. Will I watch it again? Probably not for a while, but I am definitely not throwing it away. After suffering through Zombie Armageddon, I figured it would be a good time to change gears and watch something else. 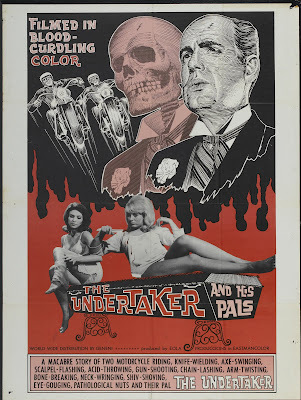 I picked the last flick on disk one of the Horror: Do Not Watch Alone Collection, The Undertaker and his Pals from 1966. Plot/ An undertaker and his two friends, who are restaurant owners, drum up business by going out on the town and killing people; the restaurant owners use parts of the bodies for their menu, and the undertaker gets paid by the families to bury the remainder. Their racket goes awry when 2 detectives suspect that something isn't quite kosher. I do not know why I even bothered to put in disk 2 of this Zombie Bloodbath DVD. I should have known that after suffering through Zombie Bloodbath and Zombie Bloodbath 2: Rage of the Undead (1995), that there was no way that a decent movie was about to follow. Zombie Bloodbath 3: Zombie Armageddon (2000) truly took the cake. Plot/ A bunch of zombies that are used by the government to fight in a major war in the near future get launched into space. The space shuttle gets caught in a time warp and returns to Earth in the present day. Naturally, the zombies get loose and terrorize a motley assortment of folks who are trapped inside a high school. I am a glutton for punishment! After suffering through Zombie Bloodbath the other day, I decided to continue with the trilogy with Zombie Bloodbath 2: Rage of the Undead (1995)! Plot / An evil demonic scarecrow resurrects the dead as ravenous cannibalistic zombies who feast on the living. A motley assortment of folks who include a bunch of bickering college kids, a trio of dangerous escaped convicts, an equally lethal pair of savage hoodlums, and three sisters do their best to stay alive and survive this harrowing ordeal. After spending some time with the classics, I figured it was time to finally watch part of the Zombie Bloodbath Trilogy that stumbled upon the other day. 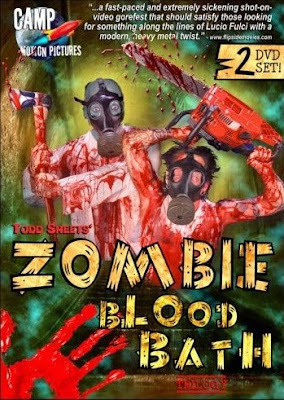 This low-budget, early 1990s zombie (Zombie Bloodbath Part 1) flick by Todd Sheets seems perfect for the evening! Plot / A meltdown at a nuclear power plant turns a bunch of folks into lethal shambling flesh-eating zombies who go on a gory rampage. Time to continue with some of the classics I have on hand. Today’s choice was Carnival of Souls, the 1962 Herk Harvey entry that has influenced greats such as George Romero and David Lynch. Plot / Mary Henry is enjoying the day by riding around in a car with two friends. When challenged to a drag, the women accept, but are forced off a bridge. It appears that all are drowned, until Mary, quite some time later, amazingly emerges from the river. After recovering, Mary accepts a job in a new town as a church organist, only to be dogged by a mysterious phantom figure that seems to reside in an old run-down pavilion. It is here that Mary must confront the personal demons of her spiritual indifference. It feels like forever since I watched and reviewed a movie, although it has only been a couple days. 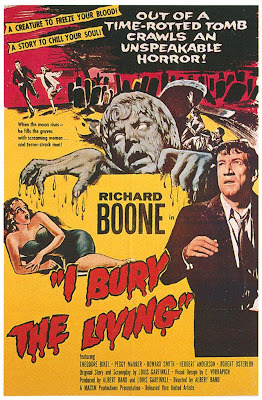 So, to fill my horror craving, I decided to watch the 1958 Albert Band classic I Bury the Living, to help pass the evening. Plot / A newly appointed cemetery chairperson discovers that, merely by inserting a black pin into a wall-sized map of the cemetery, he can cause the deaths of that plot's owner.